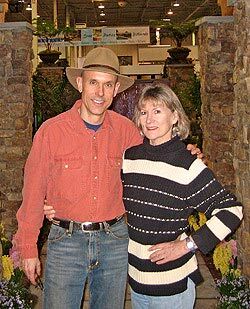 There’s trouble—yours truly gets up close and personable with garden writer and Ranter Susan Harris. No offense to the three other fine founders of the popular garden blogsite GardenRant, but garden guru Susan is the first one I’ve had the privilege of meeting, and dish the dirt we did. Susan and I hooked up recently in Chantilly, Virginia, while I was in town speaking at the Capital Home & Garden Show. She was polite enough to come to one of my presentations, after which we enjoyed a fine dinner and great gabfest. Ms. Harris is quite a story. Abandoned by wolves and raised by Republicans (OK, Susan, I stole that line from Stephanie Miller, but it works, don’t you think? ), Susan has hammered out quite a career and following, both as a garden writer and garden coach. In fact, she is one of the early pioneers in that last category. Quite a cool concept: For an hourly fee, Susan will come over to your garden and show you how to do anything you’ve got in mind to accomplish that day, whether it’s planting a tree, pruning a hedge, or dividing perennials. So what did we talk about at dinner? Oh, you know, the usual—life, love, politics (for a minute, anyway, until we both realized that was a don’t-go-there), gardening and, of course, all of you. From reading Susan’s posts on GardenRant—freewheeling, opinionated, and always to the point—I had guessed that in person she’d be a hoot, and she didn’t disappoint. I wish I had taken notes—Susan is a forward-thinker, with a keen sense of where the gardening hobby is headed. In addition to her work at Rant, she is the brainchild behind the former Regional Garden Gurus website, while somehow managing to maintain her own terrific gardening site, Sustainable Gardening Blog.